A ‘slow-burn’ marketing tool becomes the community ‘glue’ | Write-now! Published in Harcourt's Inside Magazine. Givers gain – according to David Gowdie of Harcourts Graceville, and owner of local magazine Living in The Shires. This Australia Day, Principle and Director David Gowdie of Harcourts Graceville was the proud recipient of the Moreton electorate’s Australia Day Award. 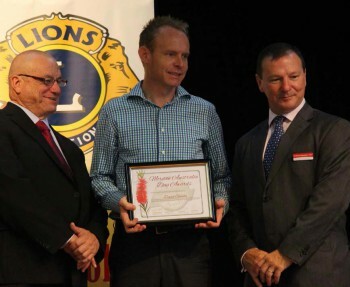 David Gowdie proudly receiving the Moreton electorate’s Australia Day Award. This award was in recognition of David’s service to the community as the creator of a local magazine called Living in The Shires. This magazine is hand-delivered by his sales agents to 12,000 homes and businesses in an area covering six suburbs of Brisbane – Tennyson, Chelmer, Graceville, Sherwood, Corinda and Oxley. This magazine is David’s brainchild. The primary motivation of was to have a magazine that specifically catered for his community. It is not a newspaper in the traditional journalistic style, but more of a storytelling vehicle – ‘creative non-fiction’, if you like. It tells stories about local businesses, community events, some of the area’s incredible residents, and its history. A deliberately small back section of the magazine is devoted to Harcourts Graceville. Even though David includes some advertising for his Harcourts business in the magazine, this is kept to a minimum. Living in The Shires is a big investment for David. In terms of marketing opportunity costs, it is a ‘slow-burn’, but increasingly the magazine is being associated with the Harcourts Graceville brand in a positive, feel-good, way. The beauty of this publication is that it has become the ‘glue’ for a community, engendering much pride in the area. And it gives the sales agents a fabulous entrée when engaging with local people – there is always something to talk about. The feedback to Harcourts Graceville is that the magazine gets read cover-to-cover, and its delivery is eagerly anticipated. It truly is a marketer’s dream. 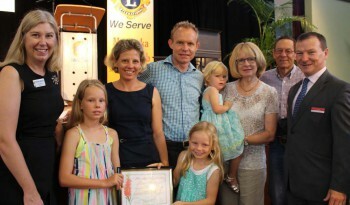 Nicole Johnston, councillor for Tennyson, with David and his wife Penny and children, David’s parents, and Graham Perrett, federal MP for Moreton. David’s initiative with Living in The Shires reflects his oft-cited observation that ‘givers gain’. His staff and everyone associated with the publication are incredibly proud of it and David’s success. The latest issue came out on 1 March and can be found on the website. Susan Prior is, what was once referred to as, a 'completer-finisher'. One of those rare people who can take all the bits-and-pieces, fix-them-up, and then put them together into a final polished-document. She is exactly the person if you are having trouble finishing a manuscript because you need it to be perfect.